Mary Ruth Cutshaw (second from the left) and her late sister Jessie Ellen Cates, were named recipients of the Tennessee Board of Regents Award for Excellence in Philanthropy during a luncheon on Tuesday (Oct. 28) at the Sevier County Campus. Also pictured are (from left) Dr. Jack Campbell, president emeritus of Walters State; Dr. Warren Nichols, vice chancellor for community colleges at TBR; and Dr. Wade McCamey, president of Walters State. Two local sisters have been recognized by the Tennessee Board of Regents for their contributions to Walters State Community College. Mary Ruth Cutshaw and her late sister, Jessie Ellen Cates, have been named recipients of the TBR Chancellor's Award for Excellence in Philanthropy. The award was presented today (Oct. 28) to Cutshaw during a luncheon at the Sevier County Campus. "It gives me great pleasure to present you and your late sister, Ms. Cates, with the Chancellor's Award for Excellence in Philanthropy for your distinguished commitment and support of Walters State and higher education in Tennessee," said Dr. Warren Nichols, vice chancellor of community colleges for TBR. "This award recognizes generous giving of resources to a TBR institution and outstanding volunteer efforts in raising funds," he also said. Cutshaw and Cates, both of Sevier County, were instrumental in the development of the college's Sevier County Campus. In 1999, they established a trust through the Walters State Foundation that helped fund the expansion of the Sevier County Campus. At that time, the trust represented the largest gift in the history of Walters State. "Jessie and Mary Ruth demonstrated a generous and caring spirit by giving back to their community and helping to improve the quality of life for all the citizens of Sevier County," said Walters State President Emeritus Dr. Jack Campbell during his remarks at the luncheon. Campbell served as president of Walters State from 1974-2005. In addition to the Excellence in Philanthropy Award, TBR previously honored Cates and Cutshaw in 2008 by naming the academic building on the campus after them, Cates-Cutshaw Hall. "We are pleased that these two great women are again being honored for their support of Walters State and for bringing higher education opportunities to residents of Sevier and surrounding counties," said Walters State President Dr. Wade McCamey. "Because of them and others who contributed to the development of the Sevier County Campus, more individuals can attain a college degree without leaving their community," McCamey said. Cutshaw worked for the U.S. National Park Service for 33 years. She served as an alderwoman on the Sevierville City Council from 1997-2004. In 2009, she was named Citizen of the Year for Sevierville. Cates was a banker for over 40 years in Gatlinburg. She passed away in 2003. The WSCC Sevier County Campus was developed entirely with funds donated by private citizens and the local city and county governmental bodies of Sevier County. The campus, which enrolls around 1,300 students, includes three buildings: Maples-Marshall Hall, Cates-Cutshaw Hall and the Conner-Short Center. Pictured: Mary Ruth Cutshaw (second from the left) and her late sister Jessie Ellen Cates, were named recipients of the Tennessee Board of Regents Award for Excellence in Philanthropy during a luncheon on Tuesday (Oct. 28) at the Sevier County Campus. Also pictured are (from left) Dr. Jack Campbell, president emeritus of Walters State; Dr. Warren Nichols, vice chancellor for community colleges at TBR; and Dr. Wade McCamey, president of Walters State. The Walters State Community College Foundation held its fall board meeting on Monday, Oct. 20, at the college's Morristown campus. In his college update to foundation trustees, Walters State president Dr. Wade B. McCamey thanked them for their support of the college. "Because of your support, our students have benefited mightily," he said. He reported that a total of 442 Walters State students received scholarships last year through the foundation. This represented the largest number of students to receive scholarships in one year. The total amount of foundation scholarship funds spent during last year was $416, 376. In discussing Gov. Bill Haslam's "Drive to 55" initiative to increase the number of Tennesseans with college degrees from 32 percent to 55 percent, McCamey told trustees that the college is focused on helping the state reach this goal. He stated that through new academic programs, innovative classroom and retention initiatives, and strong support services, the college is providing students with a learning environment that gives them the highest probability of finishing their degree or certificate. "We are doing everything we can to help our students complete a degree," McCamey said. In 2013-14, Walters State awarded 1,985 degrees. McCamey also told trustees that the college garnered national recognition last year in several areas. For the second time, the college was recognized as an Apple Distinguished Program for its use of technology and mobile devices in the classroom. And for the first time in the college's history, the Senators golf team won the NJCAA Division II National Championship Golf Tournament. Also during the meeting, Dr. Mark Hurst, vice president for college advancement and treasurer of the foundation, reported that the foundation has a fund balance of $19.5 million. The foundation, the official fund-raising arm of the college, is governed by a board of trustees and managed by a 15-member executive committee. The current president of the foundation is Glenn Thompson of Morristown. Over 6,200 credit and 4,000 non-credit students attend Walters State. The college has campuses in Morristown, Greeneville, Sevierville and Tazewell. It offers over 100 associate degrees and technical certificates. Visit Walters State's website at ws.edu. Tennessee's Community Colleges is a system of 13 colleges offering a high-quality, affordable, convenient and personal education to prepare students to achieve their educational and career goals in two years or less. We offer associates degrees and certificate programs, workforce development programs and transfer pathways to four-year degrees. For more information, please visit us online at tncommunitycolleges.org. 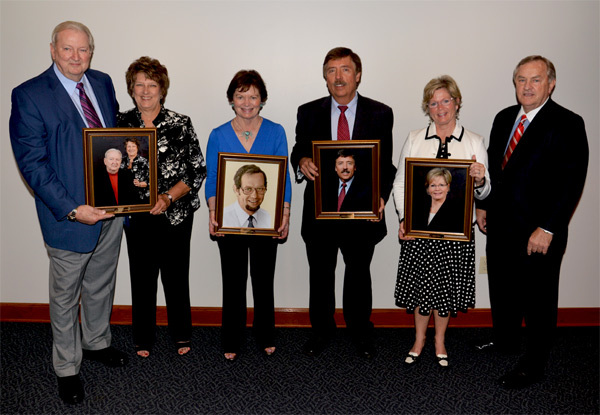 In the picture: Several local individuals were recognized for their gifts to the Walters State Foundation during the annual meeting of the trustees on Monday (May 12). From left are Linda Ogle, foundation president, Bill and Marcia Carlyle, Nancy O'Dell, Dr. Steve Rippetoe, Denise Terry and Dr. Wade McCamey, Walters State president. Several local individuals were honored for their generous gifts to the Walters State Community College Foundation and several new officers were elected during the annual meeting of the organization's trustees on Monday, May 12, at the college's Sevier County Campus. Bill and Marcia Carlyle, Dr. Steve Rippetoe, Denise Terry and the late Dr. Sam O'Dell, all of Hamblen County, were recognized with the unveiling of their portraits, which will be hung in the President's Trust Gallery at the college's Morristown Campus. O'Dell was professor emeritus of history at Walters State. His wife, Nancy, and other family and friends, established the Dr. Samuel R. O'Dell Memorial Scholarship to encourage students to become U.S. history teachers in this region. The Carlyles established the Bill and Marcia Carlyle Athletics Fund in support of men's basketball at Walters State. Bill Carlyle has been the head men's basketball coach at Walters State for 37 years. Marcia Carlyle served for over 40 years as an educator, most recently as principal of East Ridge Middle School. Rippetoe, a graduate of Walters State, is a pharmacist and owner of Howard's Pharmacy in Morristown. He has provided support for the Senators athletics program for over 26 years. Terry is an attorney practicing with The Terry Law Firm. She and her family provided funds to establish the Charles R. Terry Endowment for Athletics in honor of her late father. Also during the meeting, Linda Ogle of Pigeon Forge was recognized for her contributions as president of the foundation board of trustees. New officers elected during the meeting include Glenn Thompson, a certified public accountant from Morristown, as president; Scott Reams, an attorney from Morristown, as vice president; David Hayes, a businessman from White Pine, as secretary; and Dr. Mark Hurst, vice president for college advancement at Walters State, as treasurer. It was reported during the meeting that the foundation's net asset fund balance is $15.9 million. It was also reported that the foundation funded over $400,000 in scholarships to 442 students, which is the largest number of students to receive scholarships in one academic year. 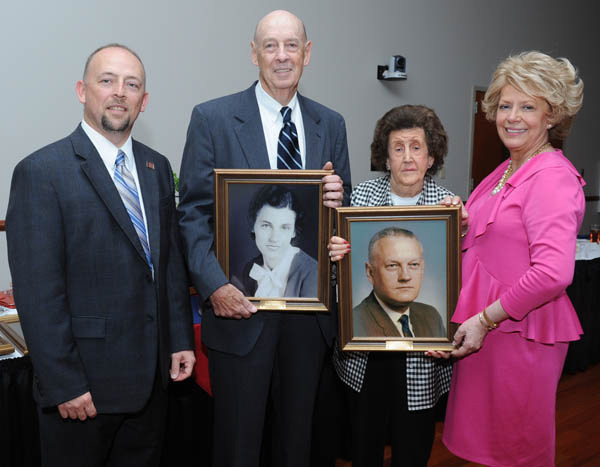 The late Ruth Stokely and John H. Stokely Jr. of Cocke County (shown in portraits) were honored during the annual meeting of the Walters State Foundation Board of Trustees. Second from left, Robert Lee is the son of Ruth Stokely and Virginia Stokely, second from right, is the wife of John H. Stokely Jr. Also pictured are Dr. Mark Hurst, associate vice president for college advancement at Walters State, and Linda Ogle, foundation president. 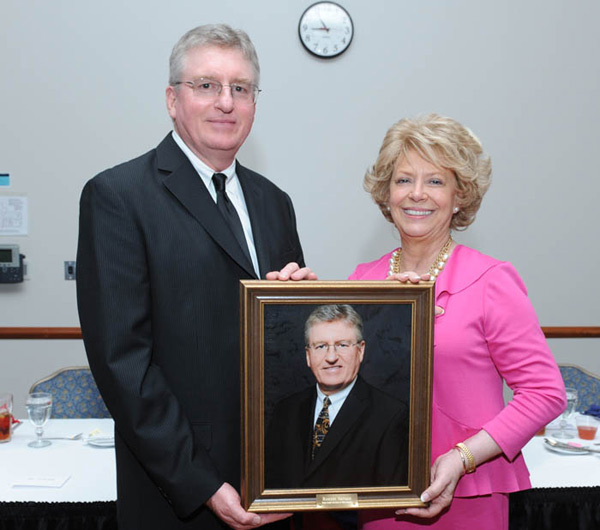 The late Vivian Litz Merhoff and Henry C. Merhoff of Morristown (shown in portrait) were honored during the annual meeting of the Walters State Foundation Board of Trustees. Holding the portrait is Elizabeth Merhoff Hughes, the daughter of the Merhoffs. Also pictured are Dr. Mark Hurst, associate vice president for college advancement at Walters State, and Linda Ogle, foundation president. Ronnie Sartain (left) of Jefferson City was honored during the annual meeting of the Walters State Foundation Board of Trustees. Pictured with Sartain is Linda Ogle, foundation president. During the annual meeting of the Walters State Foundation Board of Trustees on Monday, May 20, at the college's Sevier County Campus, it was reported that the foundation's net asset balance is just over $15 million, representing the organization's highest balance since 2006. Of this amount, the foundation recently received over $1.4 million from the estate of the late Wilma Maples of Gatlinburg to establish endowed scholarships for students attending the Walters State Sevier County Campus. Maples, a businesswoman who owned the Gatlinburg Inn, was a major donor and supporter in the development of the Walters State Sevier County Campus. "Mrs. Maples was an amazing, selfless individual who is greatly missed by the Walters State family," said Walters State vice president for academic affairs Dr. Lori Campbell in her remarks to trustees. It was also reported that 227 students attending Walters State received Walters State foundation scholarships for the 2012-13 academic year. A total of $1.9 million in scholarship assistance has been provided by the foundation for students attending Walters State during the last five years. Several individuals were recognized during the meeting with the unveiling of their portraits: Ronnie E. Sartain of Jefferson City; the late Vivian Litz Merhoff and Henry Merhoff of Morristown, and the late Ruth Stokely and John H. Stokely Jr. of Cocke County. Their portraits will be hung in the President's Trust Gallery at Walters State's Morristown campus. In other foundation business, new officers were elected. Linda Ogle, businesswoman from Pigeon Forge, will remain as president of the foundation for 2013-14. Other elected foundation officers include Glenn B. Thompson, a certified public accountant from Morristown, as vice president; H. Scott Reams, an attorney from Morristown, as secretary, and Dr. Mark Hurst, associate vice president for college advancement at Walters State, as treasurer. Also during the meeting, Campbell thanked trustees for their support of Walters State. "As a trustee, you are instrumental in the college's ability to meet its mission to provide affordable higher education opportunities to residents of this community," said Campbell. "Walters State is truly blessed to have the support of such a visionary and generous board of trustees," she also said. R. Michael Fishman (left), editor and publisher of the Citizen Tribune, was elected president of the Walters State Community College Foundation during the annual meeting of the organization's trustees on Monday at the college's Sevier County Campus. Fishman replaces Eleanor Yoakum (center) of Tazewell, who was honored during the meeting by Walters State president Dr. Wade McCamey (right) for her tenure as foundation president. 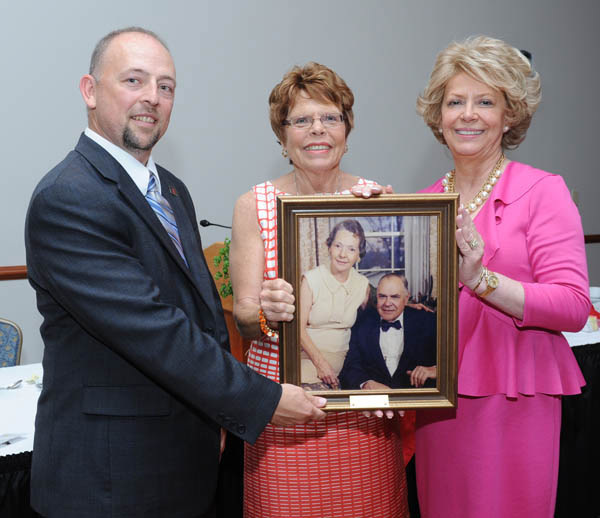 Buddy and Vicki Johnston of Kingsport were honored for their generous support of the Walters State Community College Foundation during the annual meeting of the organization's trustees at the college's Sevier County Campus. They were recognized with the unveiling of their portrait, which will be hung in the President's Trust Gallery at the college's Morristown campus. The Johnstons established a memorial endowment in honor of their late son, Doug, who attended Walters State as a paramedic student. 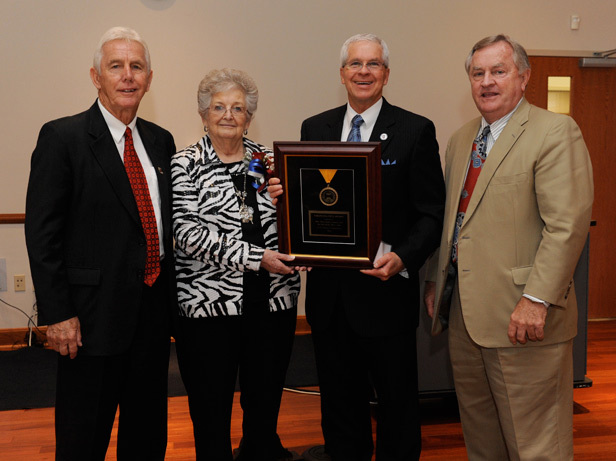 Pictured at left with the Johnstons is Walters State president Dr. Wade McCamey.